I mean, of course there is. I'm not actually surprised—or at least, I really shouldn't be. You can watch a trailer of the newly announced Duck Dynasty console game on the show's Facebook page. Duck Dynasty is, of course, the massively popular "non-fiction" show about a family that runs a duck-hunting equipment based empire. There's drama, shenanigans, comforting (and/or discomforting, depending on your point of view) throwbacks to a simpler time—all of that. I've seen a couple episodes and it suuuuuper wasn't for me, but I can certainly understand the appeal for some. Or a whole goddamn duckload, as it were. 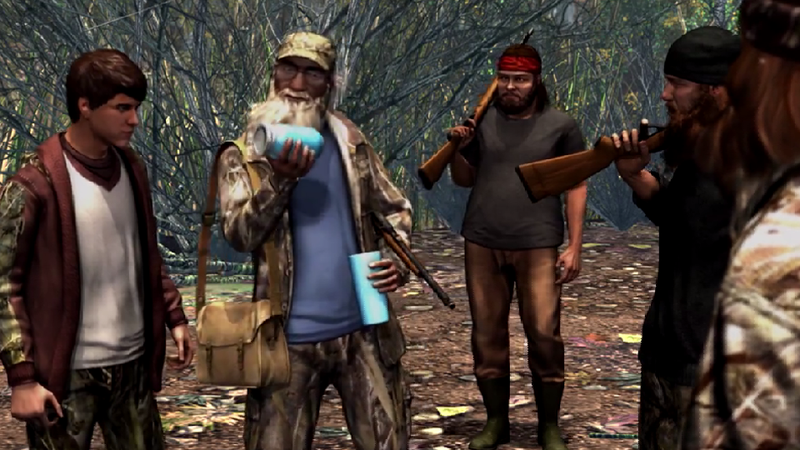 Duck Dynasty: The Video Game Coming Soon To Current-Gen Consoles, Previous-Gen Consoles, 3DS, And Probably Your Old Busted TV With Rabbit Ears, however, looks remarkably less appealing. Shame they didn't decide to make Duck Dynasty Warriors. Then maybe they'd have been onto something. But, you know, licensed tie-ins and all that. At least you can hunt and race boats and golf and there are beards everywhere—beard forests, beard everglades, beard fields far as the eye can see. If there is a majestic facial hair de-snaggling minigame, count me in. The game will be out on October 14th for PlayStation 4, Xbox One, Xbox 360, PlayStation 3, and 3DS. Activision is publishing it, but that doesn't really mean much since, again, licensed tie-in and all that. Oh well, fingers crossed for something that's at least halfway decent. I guess the mobile game wasn't all that terrible? So yeah, stranger things have happened—for instance, somebody saying, "We should turn Duck Dynasty into a video game" and "We should create this show called Duck Dynasty."